A Last Will and Testament is a legal document that someone called the testator (male) or testatrix (female), uses to put down in writing what will happen to their estate after they die. This will include who (called the beneficiary) will get what, how the beneficiary will get it when the beneficiary will get it, and naming the person (called the executor) who will be in charge of making sure the beneficiary gets it how and when the beneficiary is supposed to get it. So how and when do the beneficiaries and executor named in the will find out that they are in fact named as beneficiaries and the executor after the testator or testatrix dies? While you have probably seen movies or read a book about "the reading of the will," this is a purely fictional scenario because in reality this simply does not happen today. Apparently, years ago estate attorneys were in the habit of gathering the family in their office to read the will out loud because many people were not literate and therefore could not read the will on their own. Today, however, I am not aware of any state that requires that a will be read out loud to anyone. In fact, I have not done it, I have not witnessed any other estate attorneys doing it, nor have I ever had another estate attorney tell me that they have done it. Instead of gathering the family to read the will out loud, it is the job of the estate attorney to determine who is entitled to receive a copy of the will and then send it to them so that they can read it for themselves. The most obvious people that come to mind who need to receive a copy of the will after the testator or testatrix dies are the executor and beneficiaries named in the will - of course; they are entitled to receive a copy of the will since they are named in it. Who is entitled to receive a copy of a pour over will when the testator or testatrix also had a revocable living trust? In this case, state law will dictate who is supposed to receive a copy of the pour-over will. For example, in Florida, if the executor and the trustee named in the will are the same people, then the executor/trustee, as well as the beneficiaries named in the trust, are required to receive a copy of the will. However, if the executor and trustee are different people, then only the executor and trustee are required to receive a copy. In addition to the beneficiaries and the executor named in the will and, in some cases the trustee named in the testator's or testatrix's revocable living trust, the accountant for the estate will need to receive a copy so that he or she can read and understand what the will provides with regard to the payment of claims filed against the estate (such as credit card bills) as well as the payment of any estate taxes that may be due as well as income taxes. Is a Disinherited Person Entitled to See the Will? The estate attorney must also be aware that a disinherited heir at law or a disinherited beneficiary named in a prior will may seek to challenge the validity of the current will. If the beneficiaries or executor named in the current will are concerned that a disinherited person will file a will contest, then the estate attorney can opt to send a copy of the current will to the disinherited heirs at law or to the disinherited beneficiaries named in the prior will in order to limit the time frame in which a will contest can be filed. While the estate attorney is not required to send a copy of the will to someone who has been disinherited, this may be the best practice because it will force the disinherited person to make the decision to file a will contest or not within a specific limited period of time. So when does the reading of a will happen? After the estate attorney sends a copy of the will to the beneficiaries and executor named in it and to any disinherited person who may be considered a threat to file a will contest, each recipient will get the opportunity to read the will on their own. Regardless of who is entitled to receive a copy of a will under applicable state law, once a will is admitted to probate, it will become a public court record for anyone to see and read. Thus, once a will is admitted to probate, anyone can go to the appropriate courthouse and ask to see the will (note that in this case the person will be able to read the original will) or write a letter to the probate court and request to receive a copy of the will by mail or fax after paying a small fee. 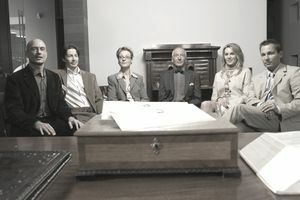 In certain circumstances the beneficiaries of the will or the executor can ask the probate judge to seal the court records to prevent the public from reading the will and all other probate documents, but the judge will grant this request only in rare situations, such as in the case of someone famous like River Phoenix or Michael Jackson. In River Phoenix's case, his will was sealed, but all other probate documents can be viewed by the public, while in Michael Jackson's case a copy of his will was leaked to the press and ended up online, but all other probate documents have been sealed.